The Asheville Planning & Zoning Commission voted 5-2 Monday night to approve the proposed redevelopment of the Sears property at Asheville Mall. 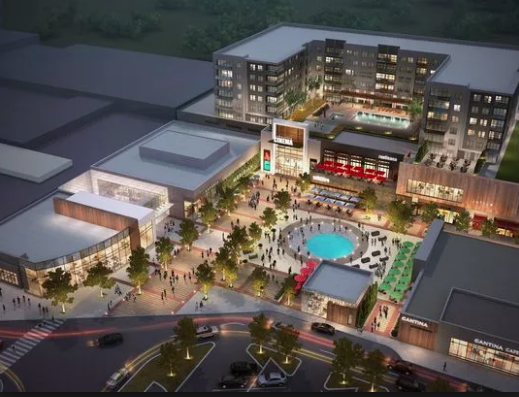 The new development includes a new six-story building with 205 apartments and a parking deck, as well as a new movie theater and retail space. 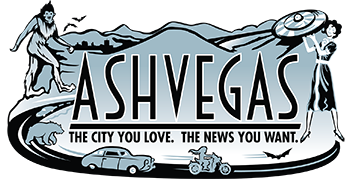 The project moves on the Asheville City Council, which has the final say. A group of about 45 residents of the Kenilworth Forest neighborhood, which rests behind the mall, packed a small meeting room in Asheville City Hall to register a number of concerns. Atop their list: worries about increased traffic on White Pine Drive off of Tunnel Road. The road serves as the only road in and out of the neighborhood, and along with the small connector Brackett Town Road, is considered the main entrance into the redeveloped Sears site. “Traffic will affect safe access to our neighborhood,” said Karen Flynn, a member of the Kenilworth Forest residents’ association. Her traffic calculations showed an additional 3,990 cars traveling White Pine Drive. “We just want a reasonable solution to our problem,” said Flynn, who wore a red shirt like most of neighbors. Other neighbors expressed concern about noise and light from the development, and about the height of the six-story apartment building, which would be one of the tallest buildings in east Asheville. Members of the commission expressed their own list of concerns, quizzing developers about pedestrian and bicycle access, their landscaping and buffering plan and urging them to push the new construction closer, and in better alignment, to Tunnel Road. Commission members also praised the project. “I think it’s an exciting development,” said commission Chairwoman Laura Berner Hudson, who’s main criticism was that the project was had too suburban a design for the major urban corridor it should address. In a report that kicked off the discussion, city planner Shannon Tuch noted the instances where developers sought a variance from city rules. She concluded that city staff did not recommend approval of the project because of the the significant variances. The commission and the development team began negotiating as the commission neared its vote. Because the developer sought a conditional zoning, a project an be approved with conditions, but both sides must agree to those conditions. 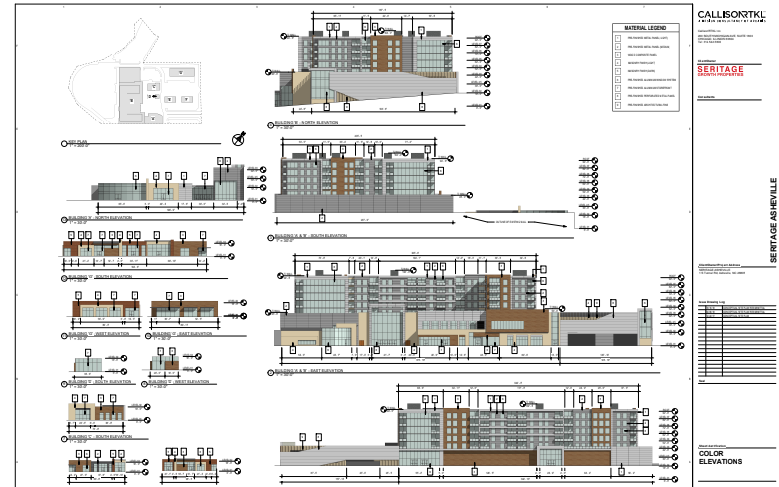 Commission members proposed the following conditions: a 30-foot buffer all the way around the project perimeter between the development and the neighborhood; 21 apartment units designated as affordable housing; a sidewalk along the part of Brackett Town Road that runs through the Seritage property; and pervious pavers in the development’s parking lot. Commissioner Joe Archibald said the project was “so close to meeting his approval. “I really want it to be thee because I like the idea … of this being a catalyst for changing this side of Asheville,” he said. After conferring with his team, Oast said the developer could agree to the 30-foot buffer and the permeable pavement. The sidewalk along Brackett Town Road could be an issue because of the topography of the area, Oast said. And regarding affordable housing, Oast said he completely understands the need for it, but the developer could not commit to that requirement. With that, Hudson made a motion to approve the project. Commissioner Sandra Kilgore seconded, and the Planning & Zoning Commission voted 5-2 in favor. Hudson and Kilgore, as well as commissioners Jim Edmonds, Karl Koon and Guillermo Rodriguez voted in favor. Commissioners Archibald and Tony Hauser voted against.